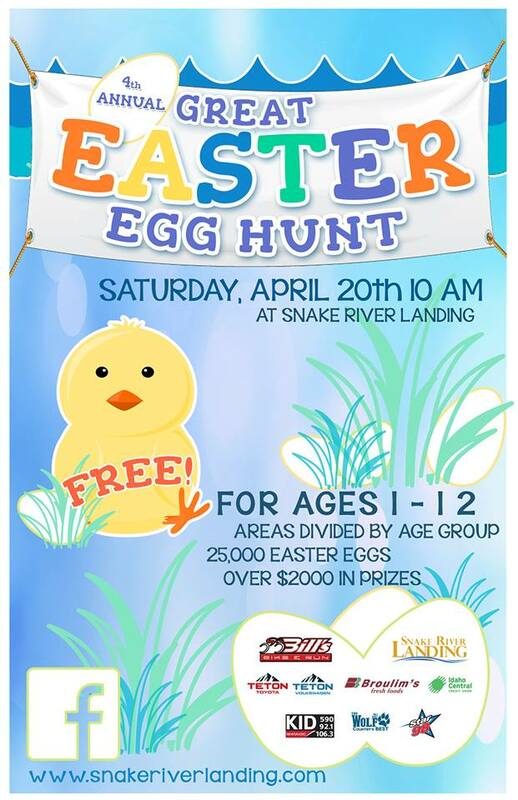 The 4th Annual Great Easter Egg Hunt at Snake River Landing is going to be huge! Your kids 12 and under can scramble to collect over 25,000 eggs filled with thousands of pieces of candy and tons of prizes! Plus get free pictures with the Easter Bunny! It all starts at 10am sharp on Saturday April 20, 2019! It’s the safest and most fun egg hunt in East Idaho! Thanks to Bills Bike and Run, Teton Toyota, Teton Volkswagen, Broulims Fresh Foods, Idaho Central Credit Union, and Star 98!